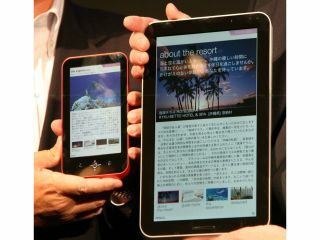 Sharp has demonstrated its new range of e-reader devices in Japan this week, with a clear design nod to the Apple iPad. The Japanese electronics giant has also launched a new software format for multimedia capable e-books, calling it the 'next gen' XMDF format. Sharp has been demonstrating two prototype readers at its Japanese event this week, a pocket-sized reader measuring 5.5-inch and an iPad-lookalike reader measuring 10.8-inch. XMDF, which stands for ever-eXtending Mobile Document Format (like, duh, obv!) enables video and animations to be mixed in with your text. From Sharp's Japanese press release: "Sharp Corporation has developed XMDF, a next-generation e-book format (hereinafter "Next-generation XMDF") with advanced features that allow users to enjoy video and audio content, in addition to current features such as texts and still images. "With next-generation XMDF as a core technology, Sharp will within this year provide digital platform to promote e-book distribution service and launch compatible reader devices to enter the e-book market. Various publishing houses (newspaper, magazines, catalogs), printing and agent companies in Japan and overseas market will be supporting Sharp to launch this e-book business. "Sharp's next-generation XMDF is an advanced version of the current XMDF format. The current XMDF format has been commercialized in 2001 and is used in e-book contents including Japanese novels and manga comics. The next-generation XMDF enables easy viewing of digital contents including video and audio, and allows automatic adjustment of the layout to match and meet publishers' needs." So it is essentially very much like XHTML but with better quality and more-readable text for settling down and reading a full novel on your new Sharp e-book. Whether or not Sharp's multimedia e-readers will be priced competitively enough to seriously make a dent in Apple's iPad market remains to be seen. Sharp's longer-term plan is to be able to offer every kind of e-book to every kind of device, including TVs, set top boxes, gaming consoles and more.